In this chapter we are going to take a brief look at some common API Gateway and Lambda issues we come across and how to debug them. 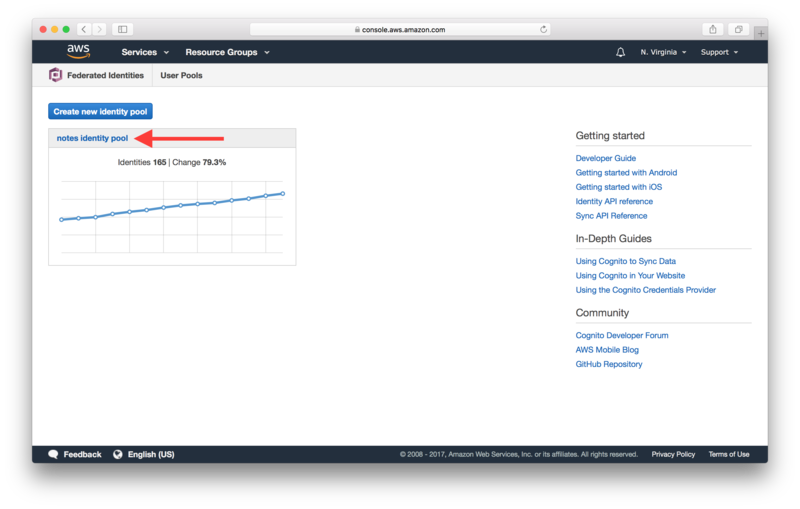 This chapter assumes you have turned on CloudWatch logging for API Gateway and that you know how to read both the API Gateway and Lambda logs. If you have not done so, start by taking a look at the chapter on API Gateway and Lambda Logs. In all of these cases, the error does not get logged to CloudWatch since the request does not hit your API Gateway project. 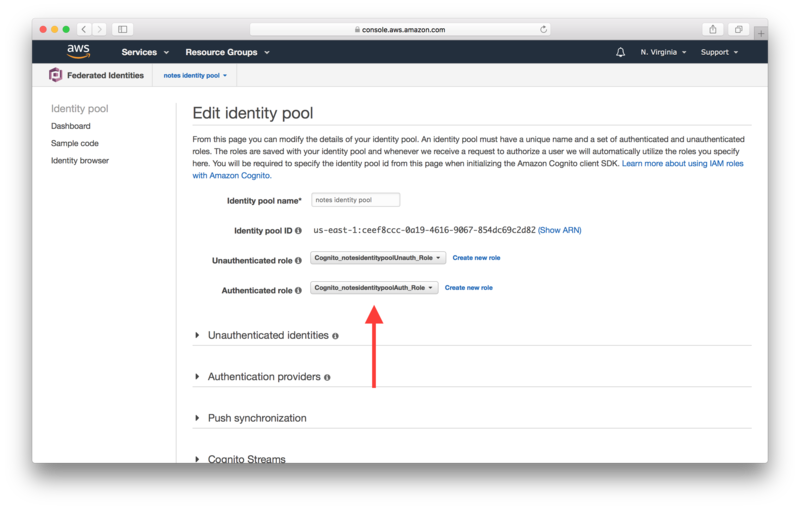 This happens when your API endpoint uses aws_iam as the authorizer, and the IAM role assigned to the Cognito Identity Pool has not been granted the execute-api:Invoke permission for your API Gateway resource. This is a tricky issue to debug because the request still has not reached API Gateway, and hence the error is not logged in the API Gateway CloudWatch logs. But we can perform a check to ensure that our Cognito Identity Pool users have the required permissions, using the IAM policy Simulator. Before we can use the simulator we first need to find out the name of the IAM role that we are using to connect to API Gateway. We had created this role back in the Create a Cognito identity pool chapter. Select Cognito from your AWS Console. 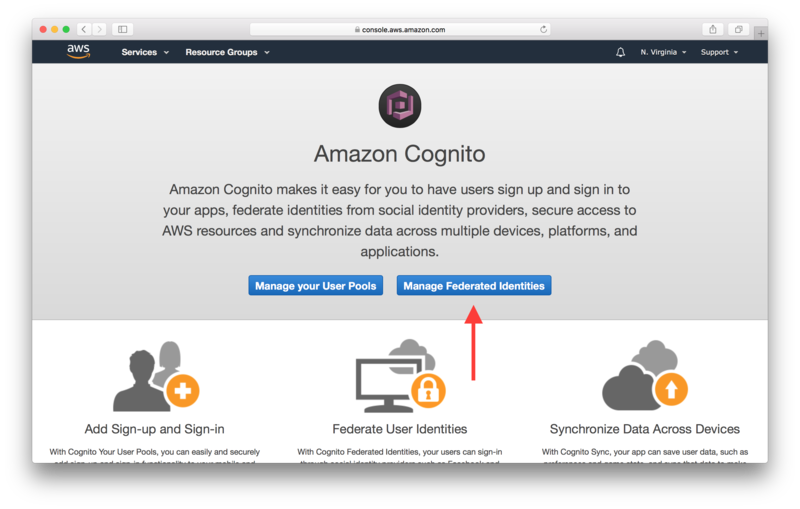 Next hit the Manage Federated Identities button. And select your Identity Pool. In our case it’s called notes identity pool. Click Edit identity pool at the top right. Here make a note of the name of the Authenticated role. In our case it is Cognito_notesidentitypoolAuth_Role. 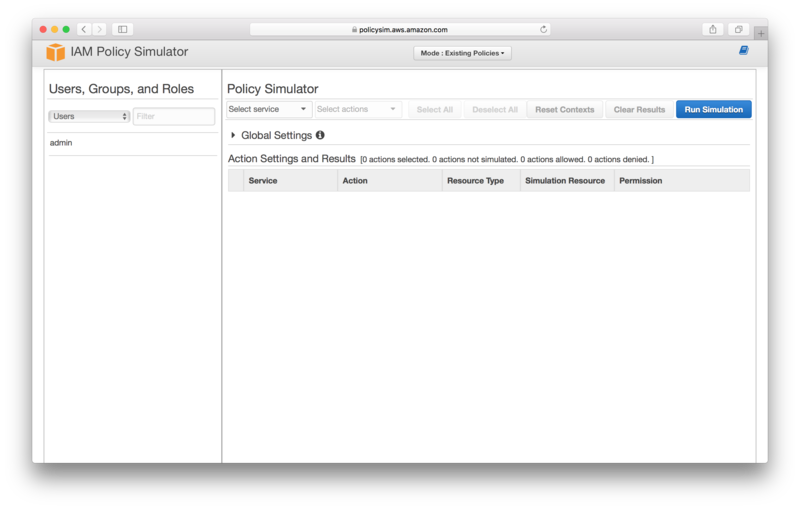 Now that we know the IAM role we are testing, let’s open up the IAM Policy Simulator. Select the IAM role that we made a note of in the steps above. In our case it is Cognito_notesidentitypoolAuth_Role. 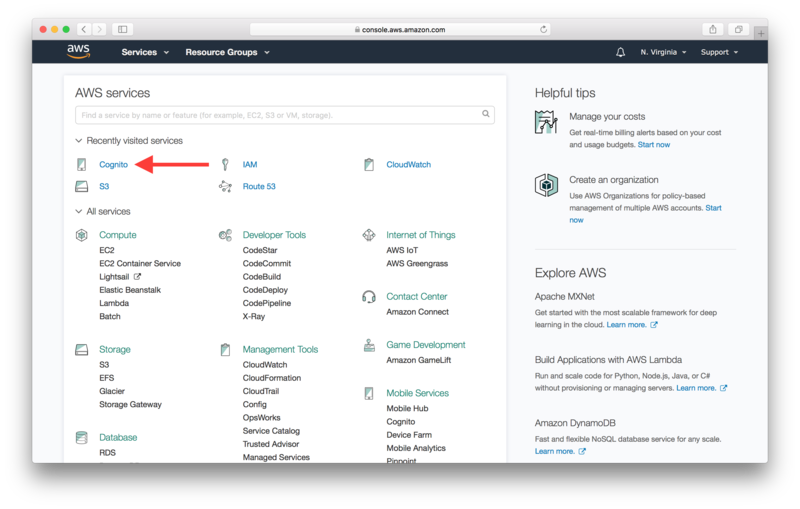 Select API Gateway as the service and select the Invoke action. Expand the service and enter the API Gateway endpoint ARN, then select Run Simulation. 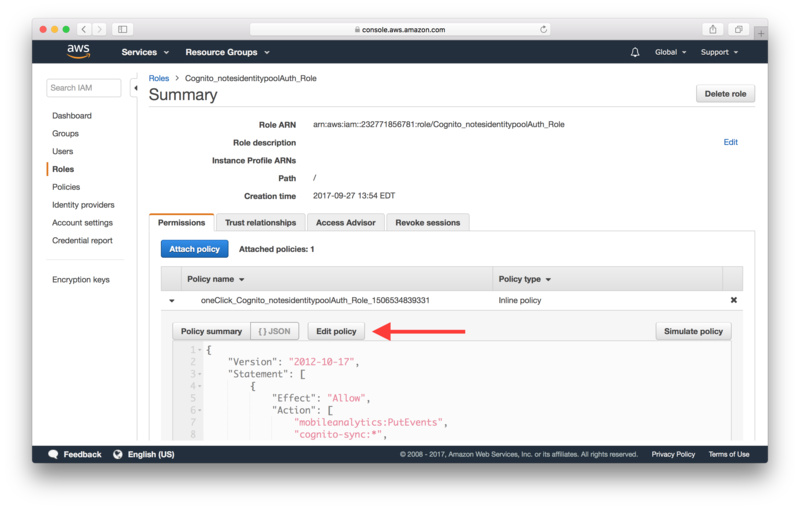 The format here is the same one we used back in the Create a Cognito identity pool chapter; arn:aws:execute-api:YOUR_API_GATEWAY_REGION:*:YOUR_API_GATEWAY_ID/*. 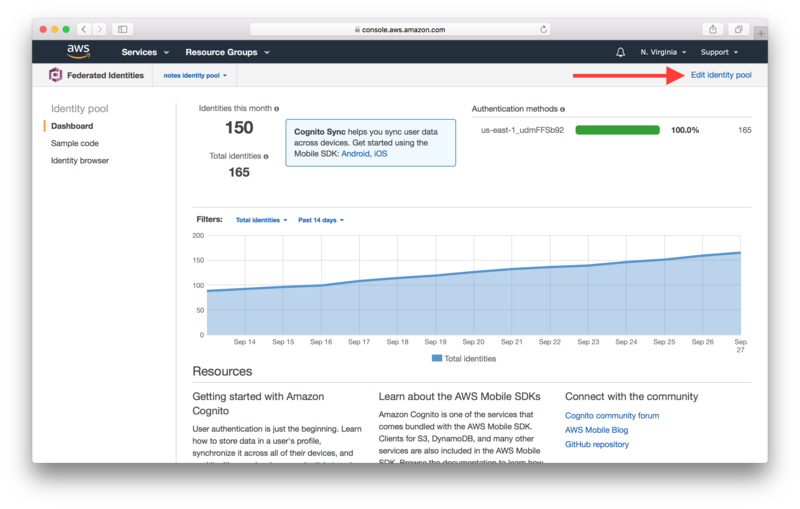 In our case this looks like arn:aws:execute-api:us-east-1:*:ly55wbovq4/*. If your IAM role is configured properly you should see allowed under Permission. But if something is off, you’ll see denied. 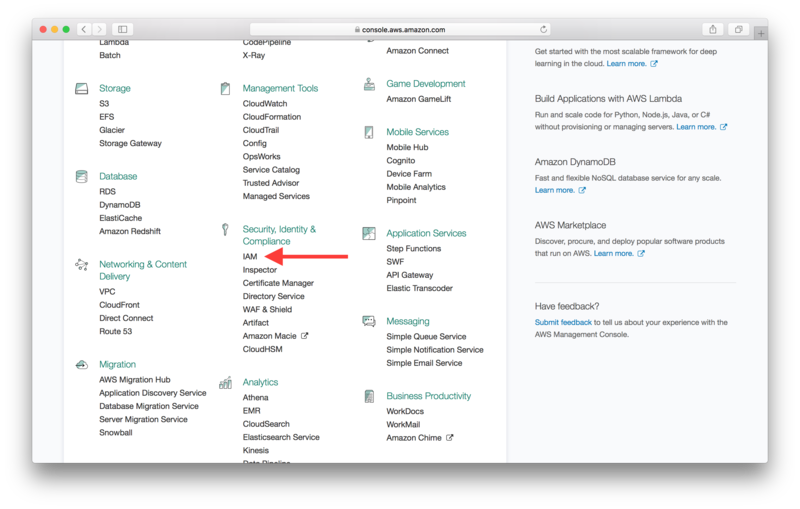 To fix this and edit the role we need to go back to the AWS Console and select IAM from the list of services. Select Roles on the left menu. 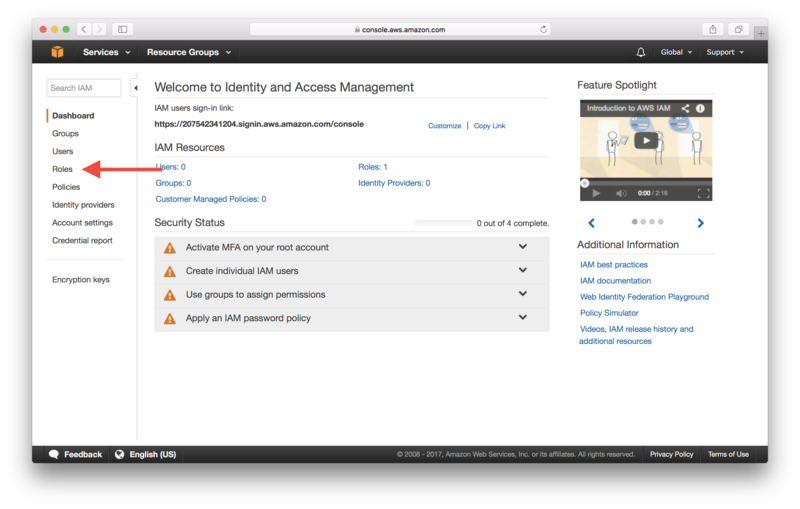 And select the IAM role that our Identity Pool is using. In our case it’s called Cognito_notesidentitypoolAuth_Role. Expand the policy under the list of policies. Here you can edit the policy to ensure that it has the right permission to invoke API Gateway. Ensure that there is a block in your policy like the one below. Finally, hit Save to update the policy. Now if you test your policy, it should show that you are allowed to invoke your API Gateway endpoint. Now if you are able to invoke your Lambda function but it fails to execute properly due to uncaught exceptions, it’ll error out. These are pretty straightforward to debug. 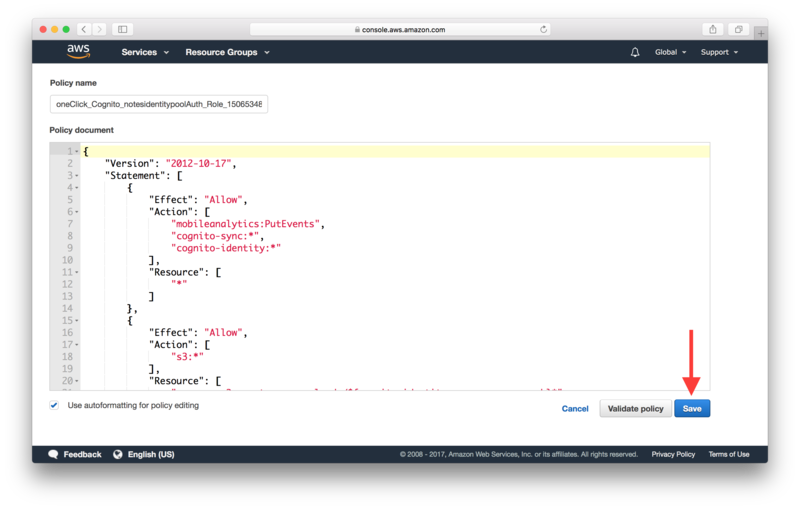 When this happens, AWS Lambda will attempt to convert the error object to a string, and then send it to CloudWatch along with the stacktrace. 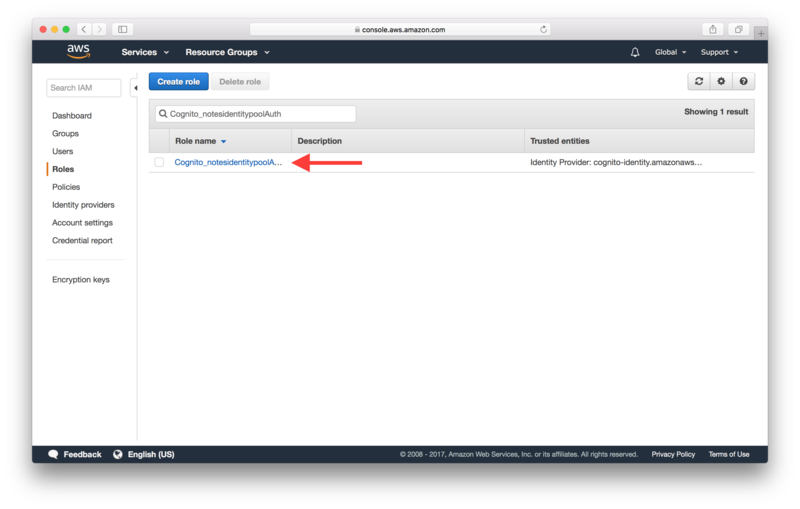 This can be observed in both Lambda and API Gateway CloudWatch log groups. Sometimes we might run into a case where the Lambda function just times out. Normally, a Lambda function will end its execution by invoking the callback function that was passed in. By default, the callback will wait until the Node.js runtime event loop is empty before returning the results to the caller. If the Lambda function has an open connection to, let’s say a database server, the event loop is not empty, and the callback will wait indefinitely until the connection is closed or the Lambda function times out. 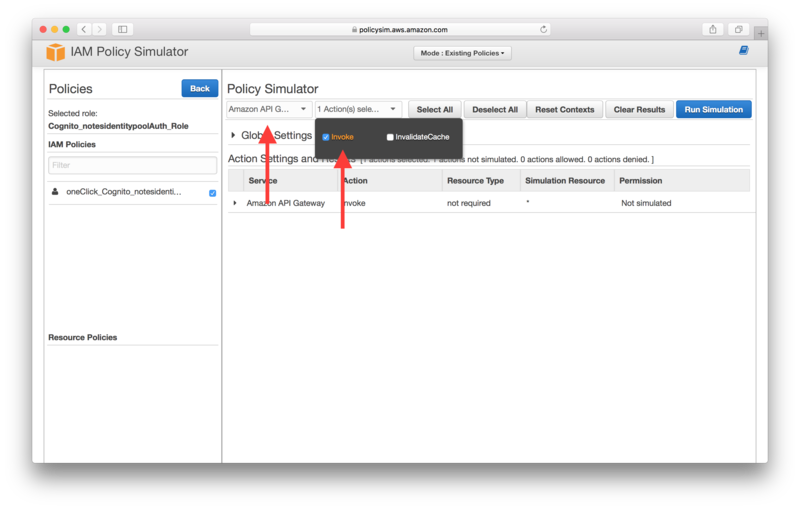 To get around this issue, you can set this callbackWaitsForEmptyEventLoop property to false to request AWS Lambda to freeze the process as soon as the callback is called, even if there are events in the event loop. This effectively allows a Lambda function to return its result to the caller without requiring that the database connection be closed. This allows the Lambda function to reuse the same connection across calls, and it reduces the execution time as well. These are just a few of the common issues we see folks running into while working with serverless APIs. Feel free to let us know via the comments if there are any other issues you’d like us to cover.